Afe Adogame, the Maxwell M. Upson Professor of Religion and Society, is a leading scholar of the African Diaspora. He holds a PhD in history of religions from the University of Bayreuth in Germany and has served as associate professor of world Christianity and religious studies, and director international at School of Divinity, New College, at The University of Edinburgh in Scotland. 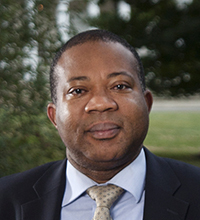 His teaching and research interests are broad, but tend to focus on interrogating new dynamics of religious experiences and expressions in Africa and the African Diaspora, with a particular focus on African Christianities and new indigenous religious movements; the interconnectedness between religion and migration, globalization, politics, economy, media and the civil society.